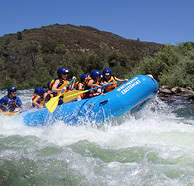 American River Rafting is the world-class whitewater destination of Northern California. With three distinct forks offering Class II, III, and IV rapids running through incredible protected landscapes, white water rafting on the American River offers both adrenaline-fueled thrills and easy, relaxing discoveries for paddlers of all ages. Its convenient proximity to Sacramento and the San Francisco Bay Area and its official designation as a recreational river make the American River a pristine vacation spot for rafting, fishing, swimming, kayaking, hiking and more. Native Americans have inhabited the resource-rich American River for more than 5,000 years before Spanish foreigners settled the Central Valley region, which was once covered in vast marshes. Fur traders of the Hudson’s Bay Company trapped beaver and otter in the early 1800s. In 1839, John Sutter established a prominent settlement near present day Sacramento, and it was one of Sutter’s employees, James Marshall, who discovered gold on the South Fork of the river, initiating the California Gold Rush. The American River was one of seven rivers in California to be given “Recreational River” status under the Wild and Scenic Rivers Act of 1972 and 1980, which recognizes and protects its outstanding natural, historic and recreational values. This 119-mile long gem of inland California runs from the Sierra Nevada mountain range until it converges with the Sacramento River in the San Joaquin Valley. Ranging through old Gold Rush territory, stunning geological formations and wildflower dotted wildernesses, the American River is fed by three popular forks. The South Fork of the American River is one of the most family-friendly destinations for river rafting in Northern California. With Class 3 rapids, the South Fork is a fantastic starter run for beginner and intermediate rafters – exciting, but not too intense. The South Fork meanders through some beautiful scenic areas, including Coloma State Park, where gold was first discovered in California. If you’re looking to accommodate a diverse group with varying levels of physical ability, the South Fork is the Northern California white water rafting trip for you. 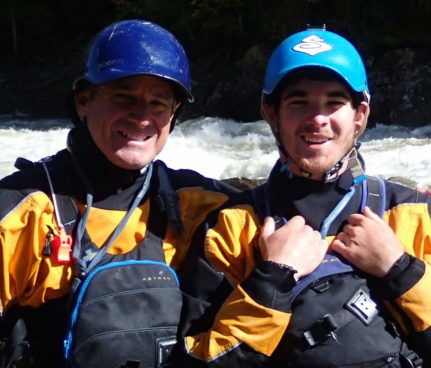 Check out our South Fork American River rafting trips. The Middle Fork of the American River is a step up in adventure. Featuring Class 4 rapids through a beautiful, isolated canyon, the Middle Fork promises some real thrills and a solitude on the river that is truly unique. You’ll experience the heart-pounding Tunnel Chute, where miners searching for gold buried beneath the American River blasted a tunnel through the side of a cliff to divert its water, inadvertently creating one of the most extraordinary rapids sequences around. For rafting enthusiasts, the Middle Fork is an absolute “must-do.” Check out our Middle Fork American River rafting trips. Unlike the hydro-dam controlled South and Middle Forks, the North Fork is a naturally flowing river that is highest during springtime snowmelt. It is the most intense and technical of the American River sections, with crystal clear waters, steep gorges and endless rapids. You must be in good physical condition and have previous river rafting experience to take on this section of the river. 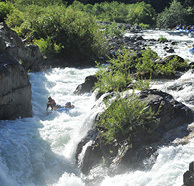 Check out our North Fork American River rafting trips. 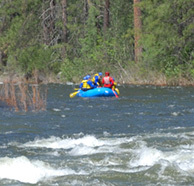 Whitewater Excitement is pleased to offer an exciting list of American River rafting trips. With ½ day, full day and two-day options on all the forks, plus combination trips and customizable options to suit your group, we feel confident that you’ll love your time on the river. Our most popular combination trip is the South Middle American River Two-Day Combo trip, where we raft the 14-mile Gorge section of the South Fork, then take the Class III-IV white water challenge on an 18-mile section of the Middle fork the next day. For even more time on the water, try the Ultimate South Middle American River Two-Day Combo trip, where we raft the entire 21 miles of the South Fork the first day, then hit the 18-mile Middle Fork on the second day. We can customize American River rafting trips for your group – call us today at 1-800-750-2386 or check availability online and we’ll get back to you within 24 hours. Booking is easy online! Reserve your American River rafting trip dates here.